I heard a brief talk this evening by someone in the business of improving airport security. The basic conclusion was that there are known technologies for solving all of the problems that make going through security a nuisance, but not yet any way of combining those technologies to solve those problems at an acceptable cost. The speaker thought that that situation would be changing in five years or so and changed in another five. It did not occur to him to ask whether the relevant organizations, in the U.S. the Transportation Safety Agency, would want to solve those problems. The system he described, while much more convenient for passengers, would require fewer TSA employees, and the employees it used would be playing a lower status role relative to the travelers they are supposed to protect—machine tenders rather than cops. Economists generally accept the principle of revealed preference—what individuals value is revealed by the choices they make. It ought to work for organizations too. What does it imply about what the TSA values? Part of the answer I have pointed out before. When you travel, TSA agents get to go through luggage which you are not permitted to have locked against them. That gives them an opportunity for vandalism or theft. There is a simple way in which the agency could reduce that problem. 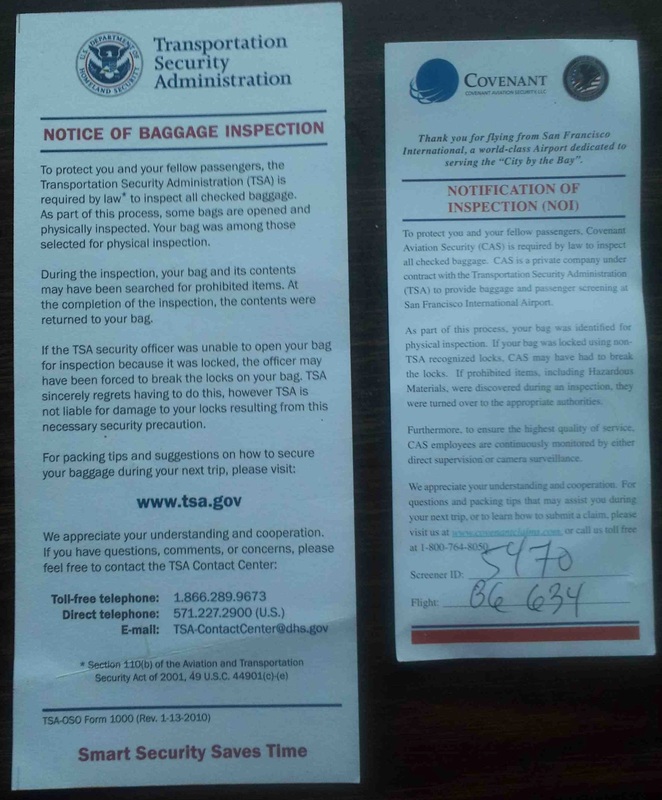 When an agent searches your luggage, he leaves a note telling you that the luggage has been searched. That note could have a code identifying for the agency the agent who made the search, allowing them to identify which agents were responsible for multiple reported complaints. The idea is sufficiently obvious so that the private organization to which security is subcontracted at San Francisco airport does it, as I discovered when my luggage was searched there. TSA does not. The obvious conclusion is that the agency does not much care whether or not its agents steal from the people they are supposed to protect or vandalize their luggage—both of which, in my experience, happen. An obvious suspicion is that they would rather not know which agents are responsible for such problems, since if they knew they might be under pressure to do something. That suspicion was reinforced when I had a brief email correspondence with a TSA representative in San Jose airport with regard to what appeared to be deliberate vandalism of my luggage. His email included a phone number. I tried calling it to continue the conversation. After about ten tries on ten different occasions, none of which reached him, I gave up—and concluded that he really did not wish to talk to unhappy travelers. If the people running the TSA do not care about the welfare of travelers even enough to take the most obvious precautions and do care, like other bureaucrats, about their own power and influence, it is hard to see why they would go to a good deal of trouble to adopt technologies that made things easier for travelers and sharply reduced the number and visibility of their employees. However good the technologies may become. P.S. A commenter points me at a much more extensive and detailed account of TSA theft and related problems on another blog.